The city of Barcelona may be renowned for its amazing architecture, delicious delicacies and arguably one of best football teams in the world, but the Catalan capital is also known to attract tourists from all corners of the globe, ready to enjoy some of the most outrageous, colorful and fun-filled festivals in Europe. 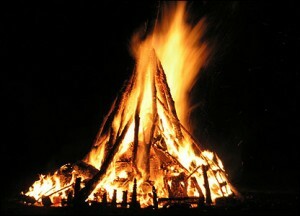 Fire and fireworks are central themes in the centuries-old celebration of the summer solstice which falls on the same night. The Sant Joan festival kicks off with the lighting of the flame of Canigó, a holy mountain peak in the Pyrenees. 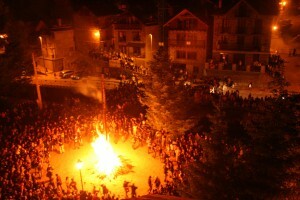 From there, the flame spreads down to bonfires, fire pits and candles all throughout the Catalonian regions of Spain and France. An estimated 3000 fires are lit from this one flame! Customs on this night range from the quirky to the downright bizarre, and include such activities as fire-jumping, the burning of old possessions, and writing one’s wishes for the year on a note and throwing it into the flames. What’s more, with Sant Joan related celebrations happening in every corner of the city, the nightlife in the bars and clubs of Barcelona becomes even more buzzing than usual on this electrifying eve! With endless Sant Joan parties across the city, you may be overwhelmed in selecting the best location to spend this unforgettable night out. The beaches of Barcelona are a favorite choice with locals and visitors alike, but can often become beyond packed as people claim their spots from which to enjoy the non-stop music and bonfires, as well as the impressive views of the fireworks. If you do choose the beach for your Sant Joan celebration, be sure to head down there in the early evening, and we suggest taking a picnic basket and a fine bottle of Cava, or two! You could also opt for any of the squares or plazas across the city, where there are plenty of firework shows and an all night fiesta is definitely in store. This option has a different, yet still highly charged atmosphere, but it is not for the faint of heart as sparks, fires and fireworks will be flying all night! Visiting Barcelona with kids? 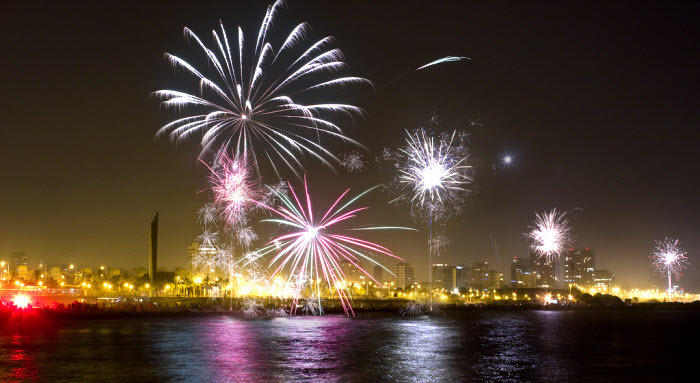 Our suggestion is to head to Montjuïc Castle for Sant Joan. From there, a panoramic view of fireworks splashed against the city skyline awaits you, without all the madness that you will find at the bigger parties. You could also take a trip to the Montjuïc Magic Fountain for a spectacular light and water show. Besides fire and fireworks, there are many more customs and traditions surrounding the Sant Joan festivities. The traditional cake eaten on this night, as well as on June 24th (the actual day of Sant Joan), is called the Coca de Sant Joan. 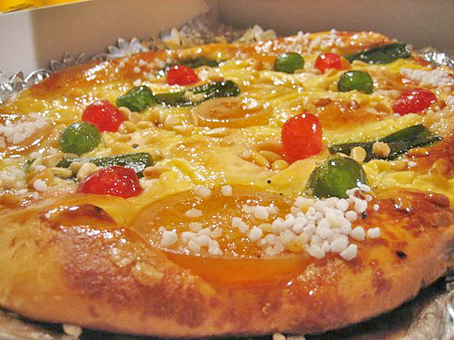 It is best described as a sweet flat bread, topped with pine nuts or candied fruits, and it is often enjoyed at family meals. But for those who want just a little taste, you will find this delicious delicacy in most of the bakeries in Barcelona throughout June. The celebration of Sant Joan and the pagan holiday of the summer solstice dates far back in history. On June 23rd, the sun reaches its highest point, before beginning to drop. Seen as a symbol of fertility and wealth, the sun must be given strength, which is ‘supplied’ by the fire and fireworks that are lit on this night. For those looking to partake in the traditions that are celebrated during Sant Joan, three more important symbolic customs are sure to cross your path. Firstly, fire is said to be symbolic of purity, and can supposedly cleanse all the past sins of those who burn items in a Sant Joan blaze. Secondly, water is known to symbolize healing, and on this night it is said that it holds extra remedial powers, capable of curing all ailments and illnesses, so you may see a few party-goers taking a dip in the Med! Finally, custom holds that the remedying powers of herbs are enhanced vastly during Sant Joan. This means, you are likely to see many locals collecting herbs in the days leading up to the Revetlla, ready to eat on the Day of Sant Joan. Known as one of the most exciting festivals in Barcelona, and spreading an undeniable energy across the city, we suggest you don’t miss out on the Sant Joan experience first-hand this June! Gather up some friends, grab one of the many Barcelona apartments and enjoy all the excitement surrounding this amazing event. 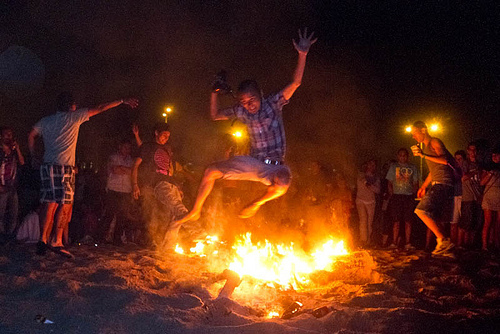 We suggest you make your way to the beaches of Barcelona and immerse yourself in plenty of the customs on display there, from fire-jumping, to bathing in the sea at midnight! This entry was posted in Bars & Nightlife, Events, Travel & Vacations and tagged barcelona activities, Barcelona culture, barcelona events, Barcelona festival, barcelona festivals, barcelona nightlife, barcelona tourist guide, barcelona traditions, montjuic, summer in barcelona, summer nights. Bookmark the permalink.